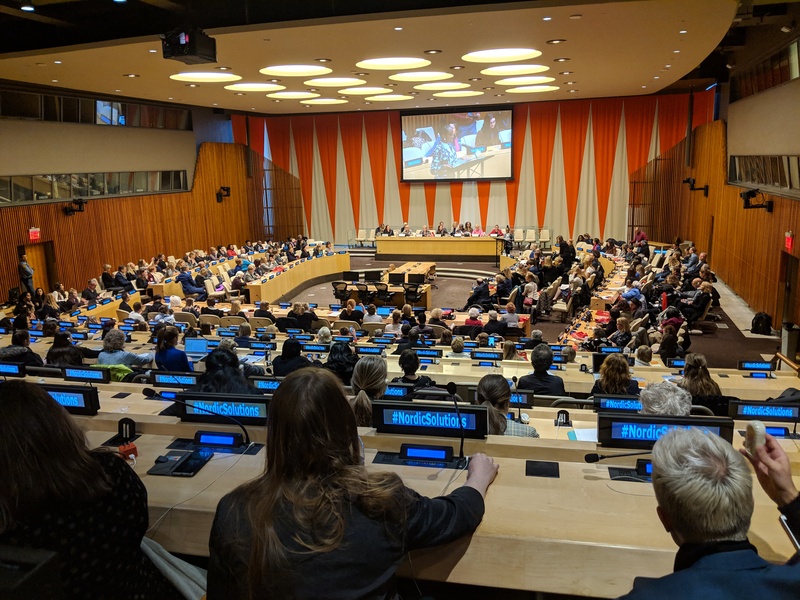 The “Nordic Solutions” session of the CSW 63 was held in the ECOSOC chamber at the UN Headquarters. The Nordic countries are well known for their progress on gender equality, high standard of living, and high satisfaction with life. I had the opportunity at CSW63 to hear from a panel consisting of the Prime Minister of Iceland and various ministers from the other Nordic countries. The women agreed that their countries are about 90% on the way to gender equality, but more needs to be done. The Prime Minister of Iceland, Katrin Jakobsdóttir, told us that when she was previously the Minister of Education, she became the first public official to become pregnant while in office. Her pregnancy made national headlines. Callers to talk-back shows said that she would likely quit her position. She instead chose to take the 5 month maternity leave granted to all new mothers and returned subsequently to assume her public duties. A Minister from Denmark told us that a media outlet decided to do a story on her family life. Instead of focusing on the competent job that her husband was doing raising three children and the benefits to the whole family, the media outlet chose to write a story of how she as a mother was neglecting her children. Yes, more can be done in every country to influence social and cultural norms! They indicated that legislation and policies can influence social and cultural norms. For example, in Norway, some years ago, only 3% of fathers took parental leave to care for their children. Norway instituted parental leave policies where 1/3 of the leave is for mothers, 1/3 for fathers and 1/3 for the parents to chose amongst themselves. If the father does not take the leave, it is lost. This has resulted in significantly more fathers taking parental leave. In addition, they have a “share the care” campaign, touting the benefits of fathers being involved in their children. The Norwegian minister said they were a wealthy country because Norway is harnessing the contributions of women to their economy. There is only a 1% difference between the number of men and women in the work force. The moderator then quipped that Norway is wealthy because they have oil. She then responded that Sweden, Denmark and Finland are also wealthy countries and they do not have oil. A hundred years ago, all the Nordic countries were poor and now they are not. Women contribute to the economy and pay taxes, which results in greater economic prosperity. I thought about Canada and where we stand. As a country we have lagged behind in a national child care program. It is encouraging that our current BC government is well on the way to a universal child care program in this province, and has made historic investments in this area. Canada provides good maternal and parental leave provisions, with one full year that can be split between parents plus an option for extended leave. However, taxation has become a dirty word here. Neo-liberal economics have fostered tax cuts, which have resulted in service cuts and growing inequalities. Women tend to use services more and they are the ones who lose in this scenario. Social and cultural norms are difficult to overcome and as a country we can do more to impact them. It is helpful to have our Prime Minister fostering gender equity as a top priority. This is a historic first! The Nordic panel concluded that gender equality leads to greater economic prosperity and happier people. It is not only the right thing to do, but the smart thing to do. Everyone in a society benefits when there is greater equality!